In-water recompression (IWR) or underwater oxygen treatment is the emergency treatment of decompression sickness (DCS) of sending the diver back underwater to allow the gas bubbles in the tissues, which are causing the symptoms, to resolve. It is a risky procedure that should only ever be used when the time to travel to the nearest recompression chamber is too long to save the victim's life. Carrying out in-water recompression when there is a nearby recompression chamber or without special equipment and training is never a favoured option. The risk of the procedure comes from the fact that a diver suffering from DCS is seriously ill and may become paralysed, unconscious or stop breathing whilst under water. Any one of these events is likely to result in the diver drowning or further injury to the diver during a subsequent rescue to the surface. Treatment of DCS utilizing the US Navy Treatment Table 6 with oxygen at 18m is a standard of care. Significant delay to treatment, difficult transport, and facilities with limited experience may lead one to consider on site treatment. Surface oxygen for first aid has been proven to improve the efficacy of recompression and decreased the number of recompression treatments required when administered within four hours post dive. IWR to 9 m breathing oxygen is one option that has shown success over the years IWR is not without risk and should be undertaken with certain precautions. IWR would only be suitable for an organised and disciplined group of divers with suitable equipment and practical training in the procedure. The principle behind IWR treatment is the same as that behind the treatment of DCS in a recompression chamber: an increase in ambient pressure will reduce the volume of the bubbles allowing better blood transport downstream of the bubbles. If the casualty can breathe pure oxygen further improvements will occur because the increase in the proportion of oxygen in the blood may keep previously oxygen-starved tissues alive and the oxygen will remove other inert gases from the bubbles making the bubbles smaller. The use of in-water oxygen at 6 meters has been shown to reduce bubble loads in divers compared to divers breathing oxygen on the surface. Six IWR treatment tables have been published in the scientific literature. Each of these methods have several commonalities including the use of a full face mask, a tender to supervise the diver during treatment, a weighted recompression line and a means of communication. The history of the three older methods for providing oxygen at 9m (30 fsw) was described in great detail by Drs. Pyle and Youngblood. The fourth method for providing oxygen at 7.5 m (25 fsw) was described by Richard Pyle at the 48th Annual UHMS Workshop on In-water Recompression in 1999. The Clipperton method involves recompression to 9m (30 fsw) while the Clipperton(a) rebreather method involves a recompression to 30m (98 fsw). The Australian IWR Tables were developed by the Royal Australian Navy in the 1960s in response to their need for treatment in remote locations far away from recompression chambers. It was the shallow portion of the table developed for recompression chamber use. Oxygen is breathed the entire portion of the treatment without any air breaks and is followed by alternating periods (12 hours) of oxygen and air breathing on the surface. The Clipperton and Clipperton(a) methods were developed for use on a scientific mission to the atoll of Clipperton, 1,300 km from the Mexican coasts. The two versions are based on the equipment available for treatment with the Clipperton(a) table being designed for use with rebreathers. Both methods begin with 10 minutes of surface oxygen. For the Clipperton IWR table, oxygen is then breathed the entire portion of the treatment without any air breaks. For the Clipperton IWR table, descent is made to the initial treatment depth maintaining a partial pressure of 1.4 ATA. Oxygen breathing on the surface for 6 hours post treatment and intravenous fluids are also administered following both treatment tables. The Hawaiian IWR table was first described by Farm et al. while studying the diving habits of Hawaii's diving fishermen. The initial portion of the treatment involves descent on air to the depth of relief plus 30 fsw or a maximum of 165 fsw for ten minutes. Ascent from initial treatment depth to 30 fsw occurs over 10 minutes. The diver then completes the treatment breathing oxygen and is followed by oxygen breathing on the surface for 30 minutes post treatment. The Pyle IWR table was developed by Dr. Richard Pyle as a method for treating DCS in the field following scientific dives. This method begins with a 10-minute surface oxygen evaluation period. Compression to 25 fsw on oxygen for another 10-minute evaluation period. The table is best described by the treatment algorithm (Pyle IWR algorithm). This table does include alternating air breathing periods or "air breaks". The US Navy developed two IWR treatment tables. The table used depends on the symptoms diagnosed by the medical officer. Oxygen is breathed the entire portion of the treatment without any air breaks and is followed by 3 hours of oxygen breathing on the surface. 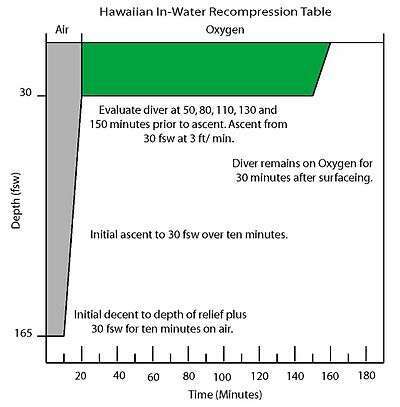 Although in-water recompression is regarded as risky, and to be avoided, there is increasing evidence that technical divers who surface and demonstrate mild DCS symptoms may often get back into the water and breathe pure oxygen at a depth 20 feet/6 meters for a period of time to seek to alleviate the symptoms. This trend is noted in paragraph 3.6.5 of DAN's 2008 accident report. The report also notes that whilst the reported incidents showed very little success, "[w]e must recognize that these calls were mostly because the attempted IWR failed. In case the IWR were successful, [the] diver would not have called to report the event. Thus we do not know how often IWR may have been used successfully." 1 2 3 4 5 6 7 Kay, E.; M. P. Spencer. (1999). In water recompression. 48th Undersea and Hyperbaric Medical Society Workshop. UHMS Publication Number RC103.C3. United States: Undersea and Hyperbaric Medical Society. p. 108. Retrieved 2008-06-08. 1 2 3 4 5 6 7 8 9 Pyle, R. L.; D. A. Youngblood. (1995). "In-water Recompression as an emergency field treatment of decompression illness". AquaCorp. 11. Retrieved 2008-06-08. ↑ Moon, RE (2000). "Recompression treatments should be to a pressure equivalent to 18 m depth. (Part 2 of 5 part Pro Con Debate)". South Pacific Underwater Medicine Society Journal. 30 (3). ISSN 0813-1988. OCLC 16986801. Retrieved 2008-06-08. ↑ Berghage, T. E.; J. Vorosmarti Jr; E. E. P. Barnard. (1978). "Recompression treatment tables used throughout the world by government and industry". US Naval Medical Research Center Technical Report. NMRI-78-16. Retrieved 2008-06-08. 1 2 US Navy Diving Manual, 6th revision. United States: US Naval Sea Systems Command. 2006. Retrieved 2008-06-08. ↑ Yarbrough, O. D.; Albert R. Behnke (1939). "The treatment of compressed air illness using oxygen". J Ind Hyg Toxicol. 21: 213–218. ISSN 0095-9030. ↑ Brubakk, AO (2000). "On-site recompression treatment is acceptable for DCI. (Part 5 of 5 part Pro Con Debate)". South Pacific Underwater Medicine Society Journal. 30 (3). ISSN 0813-1988. OCLC 16986801. Retrieved 2008-06-08. ↑ Longphre, J. M.; P. J. DeNoble; R. E. Moon; R. D. Vann; J. J. Freiberger (2007). "First aid normobaric oxygen for the treatment of recreational diving injuries". Undersea Hyperb Med. 34 (1): 43–9. ISSN 1066-2936. OCLC 26915585. PMID 17393938. Retrieved 2008-06-08. ↑ Pyle, RL (1997). "In-water Recompression (Letter to Editor)". South Pacific Underwater Medicine Society Journal. 27 (3). ISSN 0813-1988. OCLC 16986801. Retrieved 2008-06-08. ↑ Knight, J. (1984). "In-water oxygen recompression therapy for decompression sickness". South Pacific Underwater Medicine Society Journal. 14 (3). ISSN 0813-1988. OCLC 16986801. 1 2 3 Edmonds, C. (1979). "Underwater oxygen treatment of decompression sickness". South Pacific Underwater Medicine Society Journal. 9 (1). ISSN 0813-1988. OCLC 16986801. Retrieved 2008-06-08. ↑ Blatteau JE, Pontier JM (July 2009). "Effect of in-water recompression with oxygen to 6 msw versus normobaric oxygen breathing on bubble formation in divers". Eur. J. Appl. Physiol. 106 (5): 691–5. doi:10.1007/s00421-009-1065-y. PMID 19424716. 1 2 Edmonds, C. (1995). "Underwater oxygen for treatment of decompression sickness: A review". South Pacific Underwater Medicine Society Journal. 25 (3). ISSN 0813-1988. OCLC 16986801. Retrieved 2008-06-08. 1 2 Blatteau JE, Jean F, Pontier JM, et al. (August 2006). 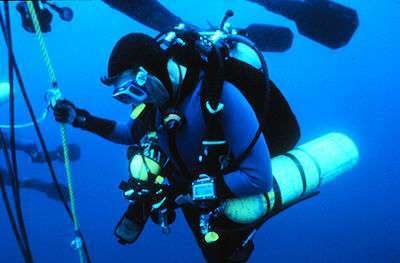 "[Decompression sickness accident management in remote areas. Use of immediate IWR therapy. Review and elaboration of a new protocol targeted for a mission at Clipperton atoll]". Ann Fr Anesth Reanim (in French). 25 (8): 874–83. doi:10.1016/j.annfar.2006.04.007. PMID 16860525. Retrieved 2008-06-08. ↑ "Annual Diving Report:2008 edition" (PDF). Divers Alert Network. Retrieved 2009-09-01. Mitchell SJ, Doolette DJ, Wachholz CJ, Vann RD (2005). Management of Mild or Marginal Decompression Illness in Remote Locations Workshop Proceedings. United States: Divers Alert Network. p. 240. Retrieved 2008-06-08. Elliott, D. (1997). "Treatment of decompression illness following mixed gas recreational dives". South Pacific Underwater Medicine Society Journal. 27 (2). ISSN 0813-1988. OCLC 16986801. Retrieved 2008-06-08. Gold D, Geater A, Aiyarak S, Juengprasert W, Chuchaisangrat B, Samakkaran A (1999). "The indigenous fisherman divers of Thailand: in-water recompression". Int Marit Health. 50 (1–4): 39–48. PMID 10970270.